Models 5424 and 5424 R are versatile 24-place centrifuge that set new standards for silence, speed and simplicity! 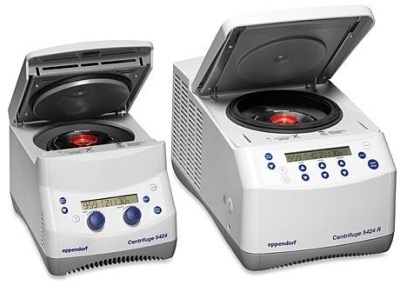 They are the direct replacement for the legendary Models 5415 D and 5415 R. These centrifuges are whisper quiet, even when running without the rotor lid, to improve your lab environment. They provide centrifugation speed up to 21,130 x g (15,000 rpm), with additional spin functions, to satisfy all of your applications. The operating concepts and overall design are based on in-depth ergonomic studies, making everyday routines faster and easier. ECO shut-off engages after 8 hours of nonuse to reduce energy consumption and extend compressor life (can be deactivated in menu). Saves you up to 40% energy overnight.